The Greenland Ice Sheet, like the ice on the continent of Antarctica, formed from layers of snow that accumulated over tens of thousands of years. Individual glaciers grew so large that they merged with other glaciers, essentially burying Greenland in ice. The thick, broad expanse of ice that covers Greenland is called an ice sheet. Though the ice is solid, the force of gravity causes it to flow slowly downhill. Along the surface and near the coasts, "streams" of flowing ice are referred to as glaciers. One of the potential impacts of global warming is the melting of the massive fresh-water ice sheet on Greenland. Scientists from around the world have been monitoring the ice sheet for over 100 years using a variety of techniques. One source of data is from ground-based weather stations that gather and record data on temperature, precipitation, wind speed, and other parameters. 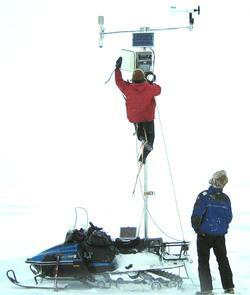 Satellite-based instruments also allow scientists to observe Greenland's ice sheet. Images from these instruments show the area or extent of the ice sheet that experiences surface melting each summer. The combination of evidence from ground-based and space-based observations has given scientists reason for concern. In this chapter, you will analyze data, read text, and view photos and diagrams from some of the scientists who are studying Greenland's ice sheet. Begin by checking the website of the Steffen Research Group for background articles and interesting video clips from May 2005. Second, go to the NOVA ScienceNOW - Fastest Glacier page. Under "Watch the Segment," choose one of the available formats and watch the seven-minute clip. In the video, you will meet some of the scientists working on this important research. How do scientists observe a glacier? What instruments and tools do they use? What do the data tell us about the ice sheet in Greenland?